Universal's contact roll coders for porous surfaces are available in both hand held and fixed mount models. Designed and built for harsh industrial environments, these coders feature precision machined components made from aircraft grade aluminum alloys, stainless steel mounting columns and shafts and sealed ball bearings for smooth print drum rotation. Unique features which include compression springs mounted over stainless steel guide rods to prevent spring breakage and delrin guides to prevent binding of moving parts provide a durability unsurpassed in the world of contact coding. Our fixed mount coders are designed to accommodate our patented 4 oz. Reservoir Ink Cartridges which re-ink the ink rolls automatically during production. If your looking for the best in contact coding equipment - contact Universal. Universal HP-100NI & HP-200 Series Hand Printers are the perfect solution for applying date codes, lot numbers and other product information in the warehouse where automatic coding is not possible. Available in both indexing and non-indexing (continuous print) models. The HP-100NI Model features a 2" x 6.5" print area. The HP-200 models feature a 2" x 9.1" print area. Print drums accommodate Universal Ribtype rubber printing dies. Recommended for use with #1150 inks for porous surfaces only. Universal Large Capacity Hand Printers are designed for off-line coding requirements where large amounts of data are required. Models are available with print areas up to 4" wide x 16-15/16" long. Supplied with re-inkable XF Neoprene Ink Rolls which can be used with both porous and non-porous marking inks. Universal MC-10 and MC-20 Series Mini-Coders are the smallest of our line of automatic roll coders. Designed for mounting directly on conveyor lines or packaging machinery, these coders are best suited for applying date codes or limited product information on cartons and other porous surface materials. The MC-10 series coders feature a 1-1/8" x 9.1" print area and the MC-20 series have a 2" x 9.1" print area. Our patented, disposable, Reservoir Ink Cartridges provide automatic re-inking of the ink rolls during production. Recommended for character sizes of 5/8" and smaller. Use with #1150 coder inks. Universal Midsize Coders are extremely versatile in design. Available in 12", 15" & the new 18" circumference print drum models which are interchangeable in the field. The longer frame design and print drum cam indexing mechanism make these coders ideal for mounting on carton sealing machinery and conveyor packaging. Optional Reservoir Roll Cover assemblies facilitate the use of our Reservoir Ink Cartridges for automatic re-inking during production. Models available in 1-1/8" & 2.0" print widths. Use with #1150 coder inks. 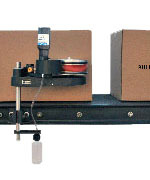 Universal Conveyor Line Printers are designed for high speed coding on larger cartons. The CLP's are the largest of our conveyor mounted coders and feature 18" circumference print drums. Available in 1-1/8", 2", 3" and 4" print widths. The extremely fast acting, dual compression spring print drum indexing mechanism is practically indestructible and provides accurate print registration on high speed conveyors. Use with #1150 coder inks.